How To Host a Valentine's Day Party! 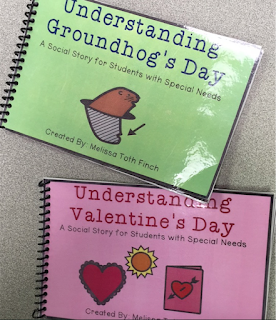 Valentine's Day can be such a FUN holiday in the classroom. You can turn a fun holiday celebration into something meaningful for your students. 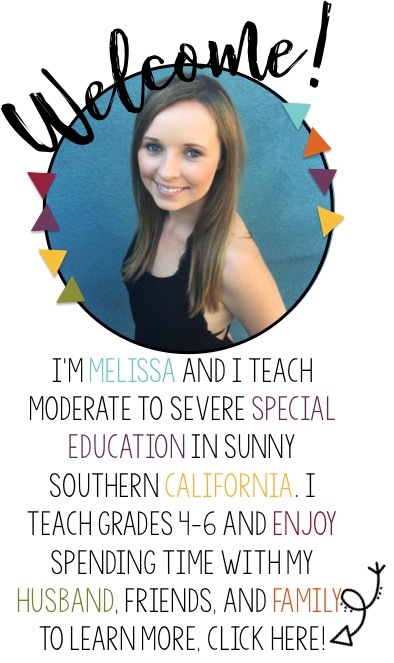 You can incorporate communication, social skills and academics in a FUN way! I wanted to share with you some ideas for YOUR holiday celebration. To read more about my February Plans click here. First things first, introduce the holiday to the students. Teach them what we are celebrating so that they know the purpose. I like to introduce the holiday with my social stories as well as some fun youtube videos. Since I live in Southern California, we can almost always go outside and enjoy the weather. I like to play different games for each holiday to promote team building, social skills, sharing and rule following! I typically break the class into small groups. The first game I am obsessed with is this ring toss game from oriental trading company. Students can toss the cupid darts into the inflatable heart! The second game I like to play outdoors is the spoon balance game. Students can work in teams to transfer the eggs via the spoon across the finish line. Another variation to the game is combining the two games, ring toss and the spoon game. Students can work in transferring the eggs from a basket to the the heart target. Another game my students love to play is one of those "minute to win it" type games! All you need is some straws and some festive pom moms. You can either play this game on the floor and have students crawl or along a table. I've actually found it to be easier on the floor! Students each get a straw to blow pom moms across the finish line. You can also incorporate some counting into this game. Have students count how many pom poms they are able to blow across the finish line using their straw! I love to cook in the classroom and I just fee that decorating goodies for the holidays can incorporate so many skills. We can work on communicating, social skills, fine motor skills and cooking skills while decorating! Before the day is over, I typically do a rotation of centers full of fun activities. This usually incorporates art activities, gifts and cards! The first craft I like to do is make a valentine's bag to collect valentines. I simply use brown bags and tissue paper to make a simple heart craft on the bag! The second craft we do is a fine motor activity. Students practice peeling foam stickers to decorate a large foam heart. Students can practice requesting colors to build those skills as well. On the back, students glue a picture of themselves and write their name to send home to parents! The next craft we do is paint a heart box with these fun dip and dot painters. I always use crayola paints as well because it is washable. We all know how messy this can get in our classroom! Students write a Valentine's Day Poem for their parents, fold it and stick it inside the painted heart box. This becomes a great gift for parents for Valentine's Day. You could of course, have students make a pice of jewelry or other gift if you choose! At my school, students are allowed to bring valentine's for their friends. I like to have students pass their valentine's out one by one to practice reading peers names, finding their friends and handing the valentine over. This incorporates so many social skills in one. Students practice their "please" and "thank you's." 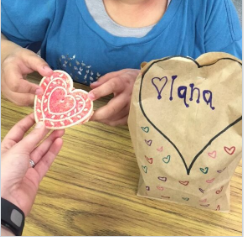 Students place their valentines in the bag they made earlier in the day during the centers! *Some of these products were sent to me free of charge. All opinions and ideas are my own.